CNI Network will act as the registered organisation with Acts 435 with the support request and need administered via CNI on behalf of a local project. Please complete this form, ask the applicant to sign and then scan and return to Paul - email (add Acts 435 to the subject) / or post to CNI Network, The King's Centre, Park Road, Halifax, HX1 2TS. This will then be added to the Acts 435 website where people will have the opportunity to donate to the need. Please do not promise the money as it is dependent on people giving to the particular request. See below for tips when posting requests and FAQ. Why is it called Acts 435? Acts 435 was inspired by the works of the early church, as described in Acts 4:35. The early disciples of the risen Christ shared their possessions, and passed money to the apostles to give to anyone who had need. How is Acts 435 funded? The organisation and administration of Acts 435 is funded by anonymous sponsorship, and by Gift Aid reclaimed on applicable donations When you donate online you are asked to say whether you are a tax-payer or not. The charity's administrative costs are kept to an absolute minimum with only one part-time employee and no fundraising department nor fundraisers employed. The running costs of the charity are WHOLLY funded by gift-aid collected on donations and anonymous sponsorship with the long-term plan that in the future gift-aid alone will cover the charity’s administrative costs. Why should I give to Acts 435 and not another charity? Because with Acts 435 100% of your donation goes directly to the people in need. You can choose who to give your money to, and all of it will go directly to that person. Church advocates are able to post 'thank you' messages from an individual applicant who has been helped and this will be sent, by email, to those donors who gave to that particular individual, giving you direct feedback as to what happens to your money. If I donate, how much of my money will go to the person in need? 100% of what is donated via Acts 435 goes directly to those in need. If you Gift Aid your donation, it helps towards the running costs of the charity which are kept to an absolute minimum with no fundraising department nor fund-raisers employed. The credit card transaction charges on your donation are also covered within our administrative costs to ensure absolutely every penny of your donation goes to the people in need. What happens if the full amount isn't raised by the expiry date? If the full amount isn't given by the expiry date, the church advocate may decide to extend the request for a further month to give chance for the remainder to come in. The applicant will always get whatever has been received though in some cases, where the request is for something specific, it won't be enough on its own to buy that item. In those cases, we advise the advocates to use it in the most appropriate way for that particular individual/family. As it happens, a high percentage of requests posted are met in full by donors, and those that are not met tend to be more 'quality of life' requests or where £100 (our cap for requests) is clearly insufficient for the need - eg. flight, driving lessons, etc. We use general funds (such as standing orders and Gift Aid receipts) to match fund external donations given after a month has passed. The request may need extending up to 2 months if nothing has been given at the end of a month but after 2 months, the majority of requests are given to. How are our donations managed to ensure that the item requested is purchased and not something else? We allow each church to manage the giving of the funds/ purchase of the item in accordance with their usual policies and procedures, along with guidelines from us. Church advocates know each applicant and whether they can trust them with the cash to use for the required item, or whether it is best to purchase it on their behalf. We encourage church advocates to accompany the applicant and purchase the item together to ensure both that the funds are used correctly and that there is some pastoral care for the individual/family in need. Can furniture and other items be donated? Acts 435 does not have the facility to receive donated items and store them. We make sure our church advocates are aware of the different furniture resources available to them like freecycle and the Furniture Reuse Network. Some of our participating churches also run Furniture Banks and source need from there first, only posting an Acts 435 request where they do not have those items of furniture in stock. Others are networking with local charities to purchase cheap good quality furniture with the money raised through Acts 435. Where there is someone who has an item to donate which is being requested for on the website and they live in the same area, they can email admin@acts435.co.uk to communicate this and the Acts 435 team will put them in contact with the local church advocate to see if they can arrange the transfer of the gifted item to the individual in need. How can I find more long-term assistance to help with financial difficulties? How does my church become a member of Acts 435? We need more churches to become involved with Acts 435, and help people in need in your community. 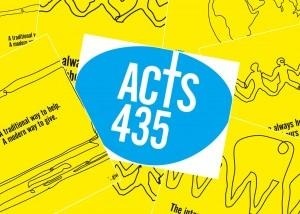 If you’d like to know more about getting involved, please email admin@acts435.co.uk. Do you have to be a Christian to ask for money? No. Acts 435 is run through churches and local charities and we usually ask that applicants are known to the church/charity or to a referring organisation they have connected with in order to make a request. This means that we can vouch for the people asking for money and minimise fraud. What is Acts 435 doing to protect against fraud? Individual applicants applying for help must live or work in the local church's wider community and be known to the church or participating charity or to an organisation the church has partnered with to reach more people in need. Acts 435 requires that they produce proof of their identity, and our advocates will be trained to vet forms of ID. How much money can people ask for? People can apply for help up to three times each calendar year, asking for up to a maximum of £300 per individual, per year. The current cap on requests is £120 for specific items (eg. a cooker, a bed) and £100 for more general requests (eg. clothing, food, household goods). This is to reflect that it is very difficult to source some items for just £100. The increase to £120 was introduced in April 2014. Many of the items that are being requested will cost £120 or just over. In some of these cases, the shop sourcing the goods drops the price to help the individual/family, in others the individual/family raises the remainder to make up the amount required. We encourage our advocates (the church/charity volunteers) to post smaller requests so we do have ones for £50, £90 debt relief orders, £80 etc. but the majority are still at £100. This is because many applicants are in great need and understandably, advocates want to get as much help as possible for them to ease their situation - eg. if they only have the clothes they are standing in, £100 will see them as best equipped as possible. Why are there a lot of requests for household goods? Some of our participating churches provide care parcels of household goods for applicants rather than raising money for a specific item in particular. Please see here for a full explanation of this. ​You may see a number of requests on our website for the Debt Relief Order fee of £90. Churches and charities are finding Acts 435 a particularly good resource for this as not many other funders will consider it and yet it can make a huge difference to those in poverty. Please see here for more information on how Debt Relief Orders and Bankruptcy work.